A quick, simple and fresh prawn salad recipe made with quinoa, papaya and roasted peanuts in a zingy chilli and lime dressing. 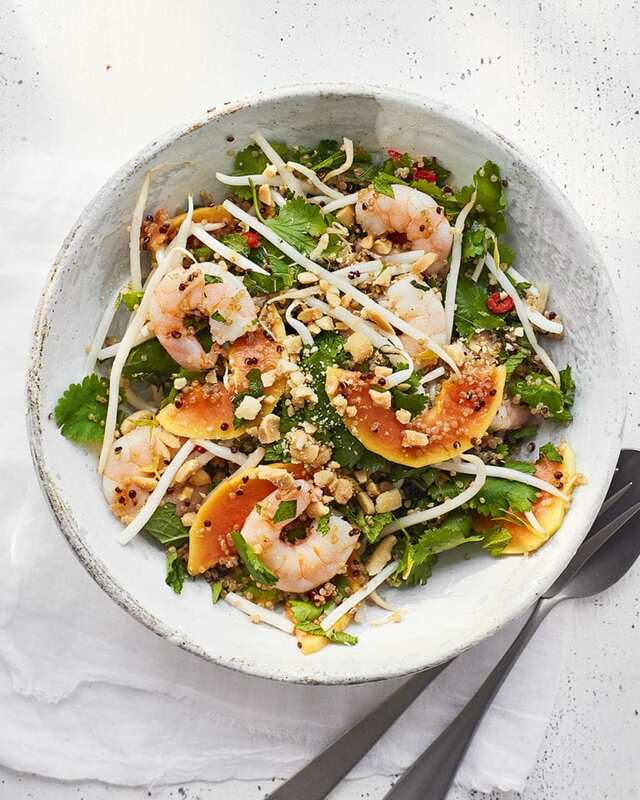 In a large serving bowl, toss together the quinoa, prawns, beansprouts, papaya, coriander and mint. In a small bowl, whisk together the sesame oil, lime zest and juice, chilli and some salt and pepper. Toss with the salad, then scatter over the peanuts and serve with lime wedges for squeezing. Next time: Try swapping the prawns for cooked chicken, pork or beef. If you can get hold of unripe green papaya, use it in this salad instead of ripe orange papaya, peeled and cut into strips.